The first stage of the Top-8 is over. As you remember, pairs for this stage were formed by drawing lots, according to the conditions of which the athletes from the champions group were drawing odd numbers, and the athletes from the group of contenders were drawing even. Thus, in each pair there was a champion and a contender. Before the beginning of the second stage, the Top-8 participants will have one more draw, now inside each group. What is the reason? There are several. First, we keep the element of surprise. Secondly, it is about justice. Now each group holds its own draw and you do not need to draw even and odd numbers, but just everything in a row - from one to four. 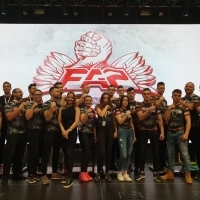 In addition, we are thinking of bringing sportsmen together in one place for this draw and to meet with armwrestlers, hold seminars and open training sessions, and work out the special entertaining program. The draw must take place no less than a month before the event. One of the options where the second draw will be held is Korea. In this country, a lot of a lot of gaming playgrounds with good technical support for streaming. You can use one of these places for our broadcast. It does not take much time, perhaps about an hour. The third stage will take place without a draw. Igor Mazurenko: “The second draw will be no less exciting and fascinating than the first stage of the Top-8. We will plan a special entertainment program for children, so that both they and the audience will be interested to watch what is happening. For me, the most interesting pair that may emerge as a result of the draw in the upper grid will be Laletin - Prudnik. We saw a huge difference between Prudnik and Babayev, for Evgeniy Laletin will not be an easy opponent because of anthropometric indicators. Or Laletin - Ongarbaev. I do not think that Kydyrgali can do something to Vitaly, but it's interesting to see”. Prudnik vs. Babayev: Did the Strategy Help? Igor Mazurenko: The first stage of the Top-8 is not over yet!